When you enter our country restaurant you will be hit with a warm, friendly and relaxed feeling. All of our dishes are freshly made with the finest ingredients by our highly skilled chefs. 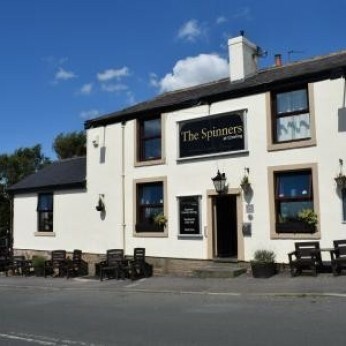 The Spinners at Cowling is owned and run by Glen and Emma. Working alongside them is fantastic head chef Steven Miller and their team of highly skilled chefs and front of house staff who will do their upmost to make sure your every need is catered for. All of our dishes are freshly made from scratch using the finest ingredients. We pride ourselves on the fact that we source all of our fresh ingredients from the local area, including our meat and poultry from McRobbs butchers, Chorley, our fresh fruit and vegetables from Ronnie Burgess, Adlington, our cheeses from Chorley Market and our finest wines and spirits from T Wrights, Horwich. Our restaurant is on the entry to the beautiful Chorley countryside and has stunning views from our decking area. We are very proud of the homely feel that we have created including our lovely log fire. We have had customers travel from miles afar to sample one or more of our many whiskeys that we have on the bar. Glen, Emma and the team welcome you to our website and hope to see you at our restaurant soon.